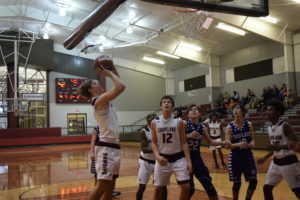 GRAPELAND – Coming off of a less than stellar performance in the Houston County Tournament, the Grapeland Sandies were looking to get back into the W column. 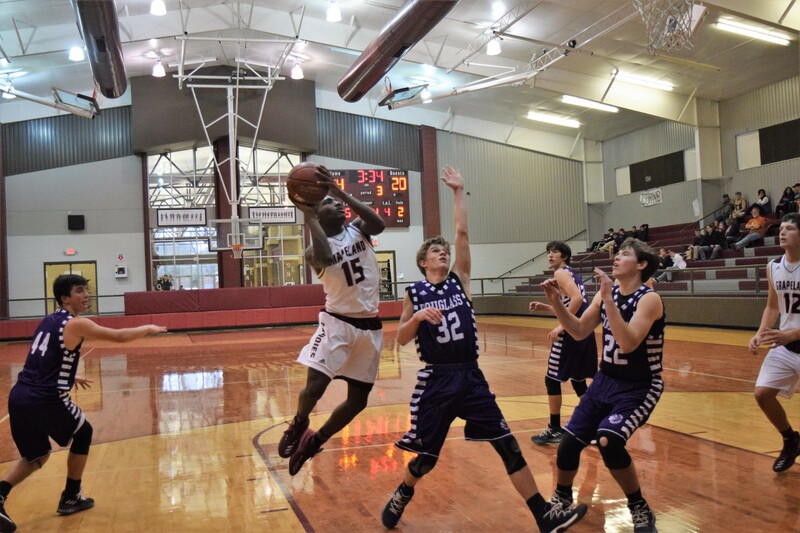 The Douglass Indians, unfortunately for them, were up next game on the schedule and the Sandies hammered them by a final score of 66-27. Grapeland limited the Douglass team to single digits in every quarter and prevented any single player on the Indians’ roster from reaching double digits in scoring. The Sandies put their stamp on the game immediately as they raced out to a 19-7 lead after the first eight minutes of play. Keizion Ashford led the way for Grapeland with 10 first quarter points. Javion Joseph, in a sign of things to come, knocked down a three-pointer while Deco Bryant, Keriaun Davis and Rick Frauenberger all had two. The Indians’ first period scoring came from John Melton with four, Jacob Bruener with two and Wyatt Tucker with a free throw. As the second quarter of the game got underway, Joseph took over the game with 10 points in the period to single-handedly outscore the Indians. 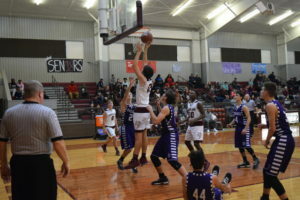 Josh “Bear” Ackley drained a three for Grapeland to give the Sandies a 32-16 lead as the teams headed into their respective locker rooms for halftime. 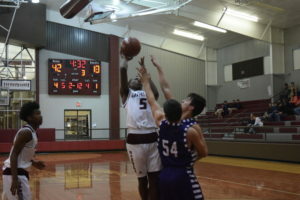 Douglass’ points came on a three from Avery Arnold and twos from Tucker, Bruener and Garrett Lowery.After the break, Grapeland put the game away. Joseph kept up his red-hot shooting from the field as he scored 15 points in the third quarter. Ackley added a pair of buckets from outside, Bryant knocked down a three and Davis dropped in two to push the lead to 56-23 after the third. Chad Watson scored all seven points for Douglass in the quarter. With a 33 point lead and eight minutes left in the game, Grapeland called the dogs off in the final period. The Sandies scored 10 in the quarter on threes from Ackley and Bryant to go along with twos from Ashford and Frauenberger. The Indians still only managed to score four points in the fourth on a three from Bruener and a free throw from Melton to make the final score 66-27, in favor of Grapeland. For the game, the Indians were led in scoring by Jacob Bruener and Chad Watson with seven apiece. John Melton had five, Avery Arnold and Wyatt Tucker both had three, while Garrett Lowery added two. The Sandies were led in scoring by Javion Joseph with a game-high 28 points. Keizion Ashford netted 12, Josh “Bear” Ackley dropped in 10 and Deco Bryant went for eight. Keriaun Davis and Rick Frauenberger closed out the scoring for Grapeland with four points apiece.